At our weekly trivia night recently a question was asked: "What is the common link for Gilligan’s Island, a university and a Punch and Judy Show?" We knew that both Gilligan’s Island and universities have “professor” in common but we couldn’t work out what that had to do with Punch and Judy. 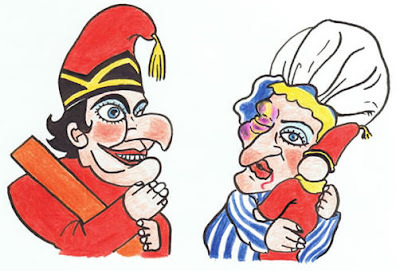 It turns out that the puppeteer inside the booth who manipulates the Punch and Judy puppets has been known since Victorian times as “Professor”. He is also known as “Punchman”. That shows once again that as new knowledge is gathered, older knowledge is forgotten or left behind. Each time a new generation grows up, an older generation of the family is eventually forgotten. Yiour parents knew their parents and grandparents. How much do you know of ancestors earlier than your grandparents? So let’s remember Punch and Judy . 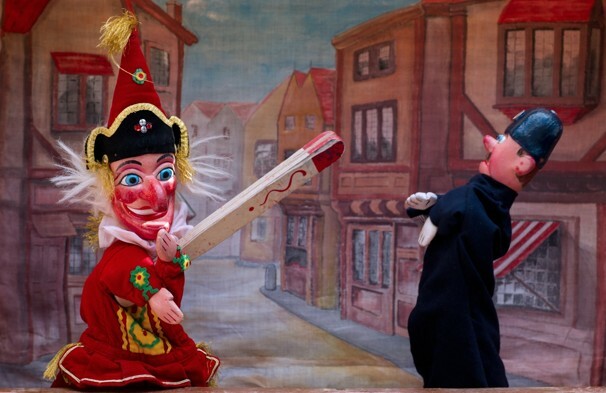 . .
Punch and Judy is a traditional, puppet show that features the violent Mr Punch and his wife, Judy. The puppeteer, the professor, operates from a booth. In the past he was often assisted by a front man who was known as the “bottler”. The bottler assisted in the backchat from the audience, played music and collected the money (“the bottle”). 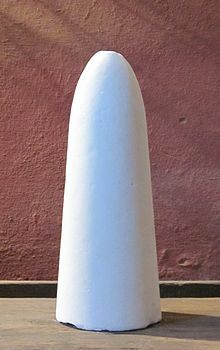 There is less use of the bottler today, especially since street shows have given way to paid private engagements. 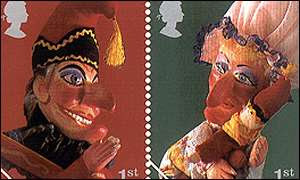 Shows usually consist of short sequences, showing an interaction between two or three characters, usually Punch, Judy and sometimes someone else: The Baby, The Constable, Joey the Clown, The Crocodile, The Skeleton, The Doctor. There is usually violence incorporated and audiences are encouraged to yell out to alert a character as to what is happening behind or to warn of a pending threat, for example, "Behind you". · a sugarloaf hat, a tall tapering hat first worn in medieval times, the name coming from the shape of loaves or moulds in which sugar was formed at that time. · a hooked nose that almost meets his hooked curving chin. That image became the sign of a grocer, depicted on his window or trade tokens. That shape has also given its name to Rio de Janeiro's Sugarloaf Mountain, a 400m peak overlooking bthe harbour. It was named in the 16th century. Punch usually carries a large stick that he uses to hit the other characters. That stick is called a slapstick. The term “slapstick” comes from the Italian batacchio or bataccio, two wooden slats used in comedy to produce a loud smacking noise without injuring the performers. The term goes back to the Renaissance and in English was translated to “slapstick”. It has since given its name to a type of exaggerated, boisterous and physical comedy, such as a pie in the face or a fall. Punch speaks in a distinctive squawking voice, produced by a device known as a swazzle, two strips of metal bound around a cotton tape reed. The professor holds the swazzle in his mouth, making it sound like he is speaking through a kazoo. Other characters do not speak through the swazzle, so that the professor has to switch the device back and forth in his mouth as he speaks from character to character. 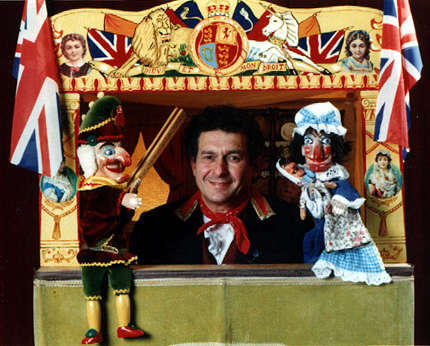 It is argued by purists that unless the swazzle is used, the show cannot be a true Punch and Judy show. 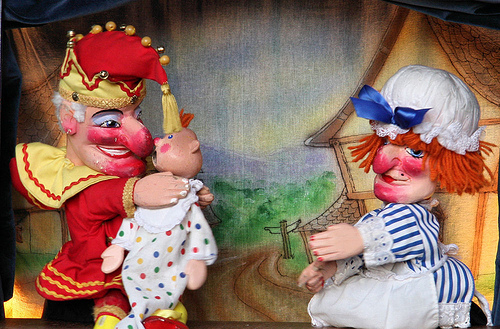 Punch and Judy have evolved from the commedia dell’arte, the masked form of theatre which began in the late 16th century in Italy, with the stock character Pulcinella giving rise to the English Punch (originally Punchinello). 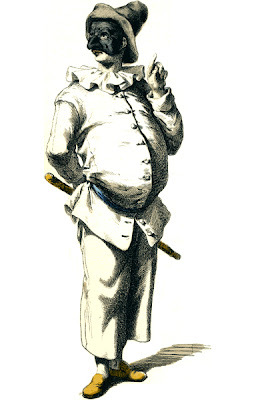 Pulcinella was dressed in a white outfit and wore a black mask, thereby contrasting life and death. His voice was created with a swazzle. Samuel Pepys recorded in his diary watching a puppet show with an early version of Punch, performed by an Italian Pietro Gimond, who was also known as Signor Bologna. From the mid 18th century, puppet shows in large tents and hired halls began to give way to glove puppet shows from booths, with a controller and a bottler to gather a crowd and collect the money. As the puppet shows became more mobile and able to be performed numerous times in a day, moving from town to town or various locations within a town, the character of Punch evolved from a stringed puppet saying outrageous things to a glove puppet doing outrageous things, including violent acts, to other characters. 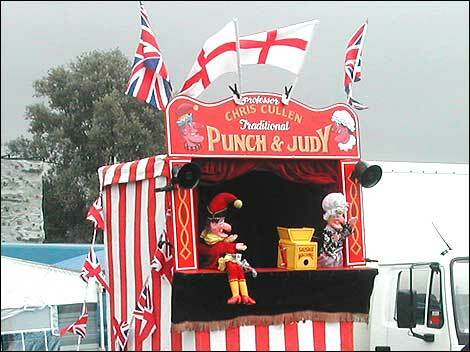 Punch and Judy shows with their striped cloth coverings came to be associated with English seaside towns and resorts. Whereas the audiences had originally been adults, with adult and risqué content, the shows evolved into entertainment for children during the late Victorian era. This had the result of inappropriate characters such as The Devil and Punch’s mistress “Pretty Polly” being dropped. The term “pleased as Punch” comes from these shows, Punch often being gleefully self-satisfied.